Choosing exterior paint colors for the #Stanley90sreno! I am SO excited that we're planning to paint our 90's fixer upper home already! We had planned to put it off till next summer but found a connection to a very affordable painter and are making it happen in less than 2 weeks! That means I have to choose a color in a hurry, which has been hard. I started out not having any idea what I wanted. 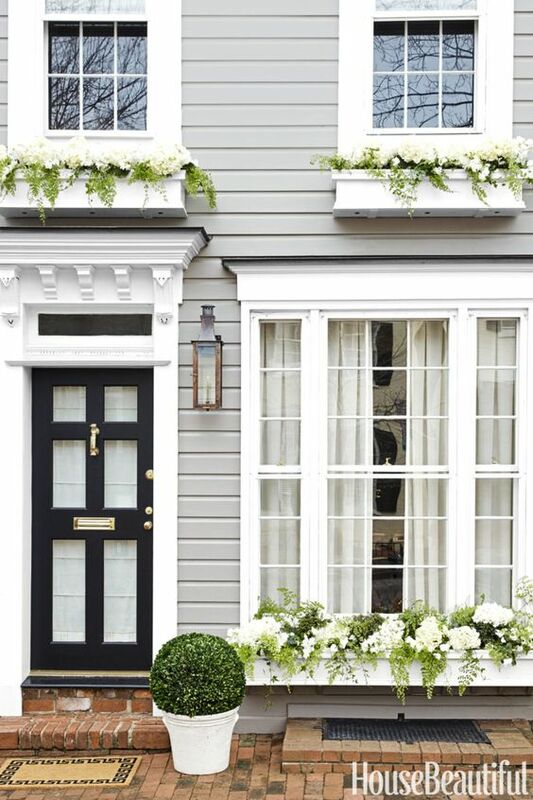 I just created a pinboard for exteriors and outdoor decor and it's all over the place. 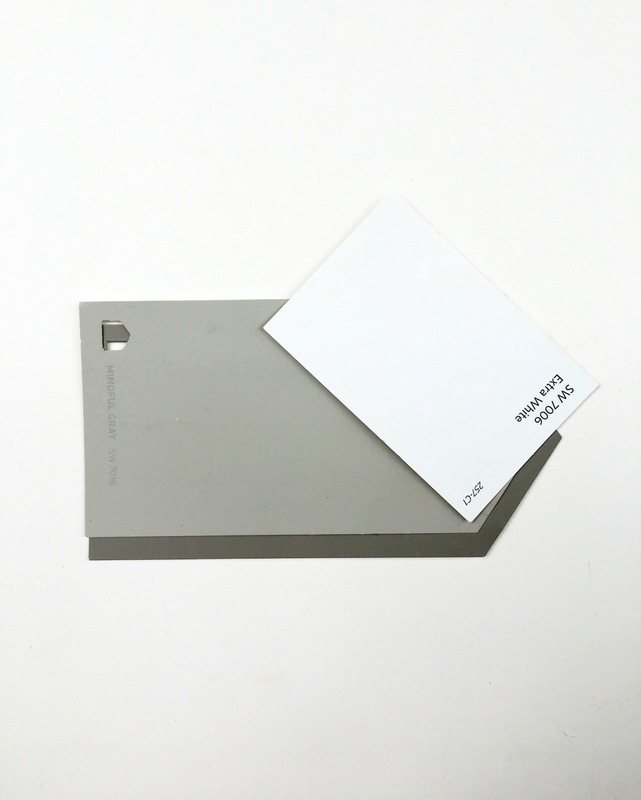 Honestly, I love white as an exterior paint color as well as an interior, and picking white would make it easy. But, Jason won't let me paint anything else white for a while... :P... and I think a nice soft color could be nice, too. 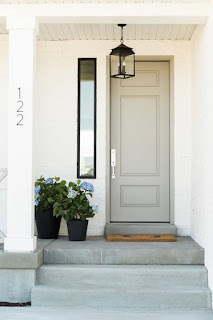 I actually also love dark navy or charcoal, but there's a house on our street that's painted a dark grey with white trim and it looks off to me. I think something about the bland early 90's style of our neighborhood doesn't lend itself to modern dramatic tones. So, I'm thinking about other colors I like. I've found a few combinations I think could work well. I like a sagey, beigey, warm, pale grey like this, plus the black door. 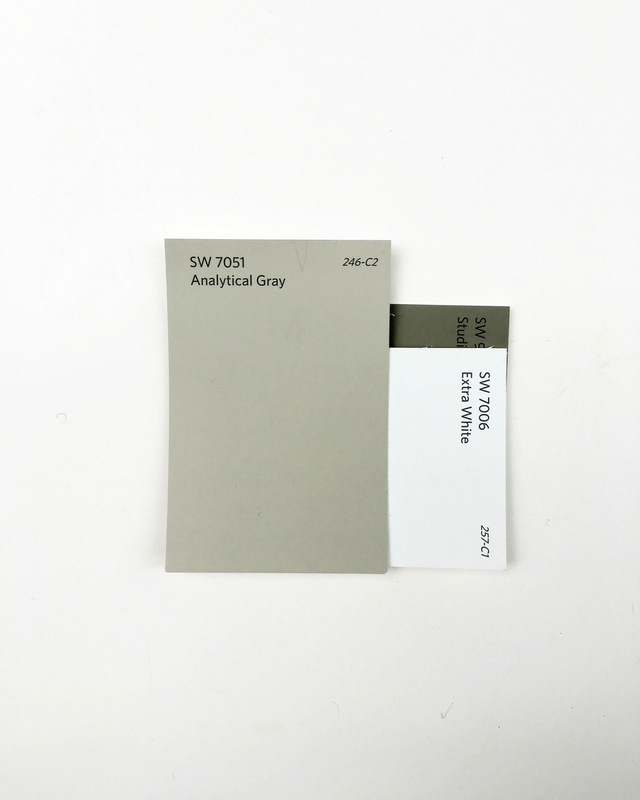 Here's another grey with white trim and a black door. Crisp and clean, right? But, our front door is kind of tucked in and in a dark spot in the front of the house already. Painting it black might make it seem dreary or oppressive. So, I've also looked at a few beige homes with darker beige (still light) doors. 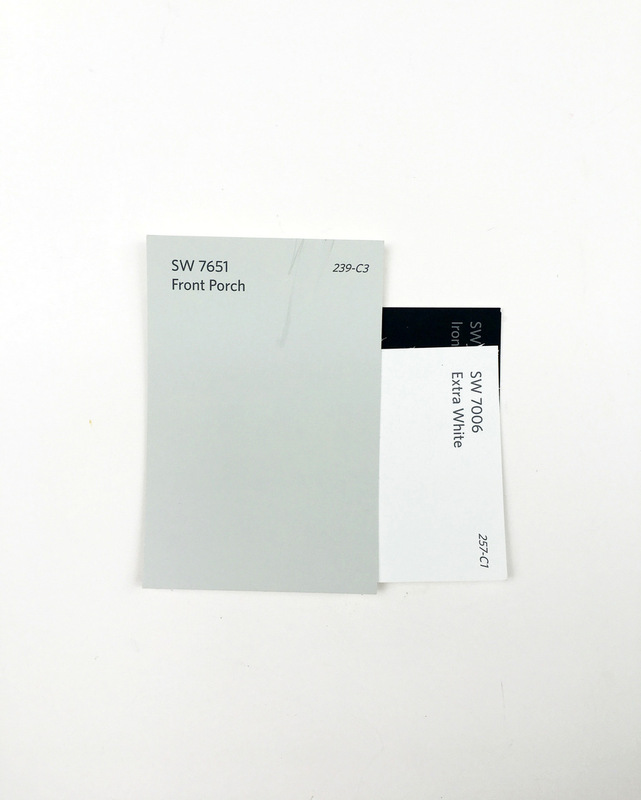 With these inspirations in mind, I collected a TON of paint swatches and have been combining them with each other. I've stuck with Extra White for the white trim, just to keep it simple and establish a constant. I know it's a good solid white, no yellow undertones. UPDATE: Due to popular demand, I've added a photo of the house now. This is from the listing. It is so embarrassingly ugly, but here it is! Here are my top picks--what's yours??! This is the lightest grey. I know colors always look darker in person, so maybe I should go with this one. But it's very silvery, not quite as warm as I was thinking. This has the warm, silvery, green-ey color I wanted, but is pretty dark! Lighter door color. I picked these combos out blind and I guess I'm pretty drawn to Mindful Grey since I accidentally picked it twice. 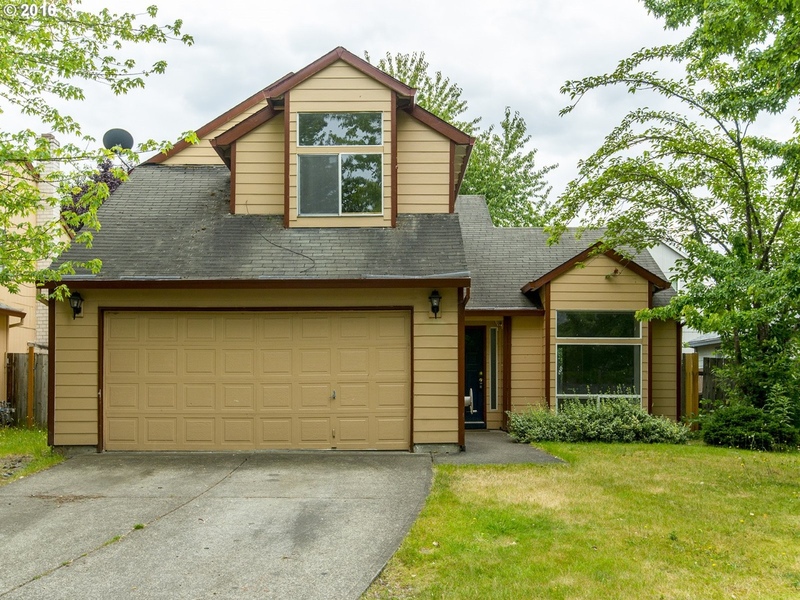 Which would you choose for a 2-story, 90's "garage with house attached" with a big window in the front but minimal trim, and a tucked-in front door? ?